For Sharon and Robert Maddox of Vestavia Hills, the approaching holiday season means even more chances to welcome family and friends to their home. But in between work, church and shuttling their four children to school and extracurricular activities, the couple has little time or energy left to decorate for every holiday on the calendar. The experts in this case are Dorothy McDaniel and her crew from Dorothy McDaniel’s Flower Market, which this summer moved from its home of 37 years in Homewood to a new space on Third Avenue South in Birmingham. Maddox first met McDaniel about 20 years ago when she was a newlywed looking to spruce up her home with fresh flowers and one-of-a-kind arrangements. Maddox said enlisting the help of professionals like McDaniel is a way for her to set priorities during the mad rush of the holiday season. Besides, Maddox said, while she loves to go shopping for clothes, shopping for home decor is not exactly her favorite pastime. “I will see things that I really love but then have absolutely no idea how to use them or how to tie them into things that I already have,” she said. That’s where McDaniel and her crew can step in to make holiday decorating a stress-free experience for families, the designer said. For example, for Thanksgiving, McDaniel incorporates the handmade fabric-and-twig turkeys that have been a part of the Maddox family’s seasonal decorations for years into a festive centerpiece for the dining room. “I love those turkeys, and Dorothy knows that it just wouldn’t seem like Thanksgiving to us without those displayed somewhere,” Maddox said. McDaniel surrounds the family’s sentimental pieces with flowers in both vibrant, seasonal hues and the cooler neutrals found throughout the Maddox home. And while McDaniel is familiar with the pieces the Maddoxes like to incorporate into their holiday decorations, she has a new challenge ahead of her this year. The Maddox family moved into its house on Vestavia Drive in March from another house in Vestavia Hills. It will be their first Halloween, Thanksgiving and Christmas in the house, and the family will host several parties and events there through the end of the year. “We watched them build this house–it was built in 1995. We would drive by it every Sunday on our way to church at Vestavia Hills Baptist, but we never dreamed we’d be living here someday,” Maddox said. The home boasts a backyard pool and a breathtaking view of the city from the front yard, but Maddox said her favorite part is that the her new home is twice as large as her previous one. It has plenty of bedrooms and living space for her four children–16-year-old Morgan, 14-year-old Richmond, 10-year-old Henry and 6-year-old Helen. Maddox and her husband both grew up in Vestavia Hills. And no matter the occasion, Maddox said it is important to her and her husband that the house be inviting. “I think my husband is just happy to have it done and ready to welcome guests after Dorothy works her magic every season,” Maddox said. While Maddox said she knows some elements of McDaniel’s decorating plans for her home, she said she and her husband prefer to keep an element of surprise about the whole process. For Halloween, McDaniel and her crew played off the elegant neutrals throughout the Maddox home with fun vignettes in every room. A collection on the kitchen table features a neutral metallic pumpkin centering a seasonal display with a whimsical pair of skeleton figures. 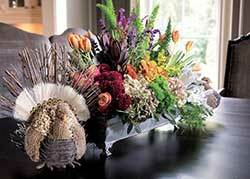 The centerpiece is anchored by vibrant fall flowers and delicate bare branches. In outfitting the Maddox home for the Halloween season, no detail was spared by McDaniel and her design crew, which includes designer Alan Townsend. Tiny jack-o’-lantern jingle bells adorn an arrangement of branches. As fall turns to winter, McDaniel will prepare the Maddox home for the harvest and Thanksgiving season by bringing out those handmade turkeys from the family’s collection. 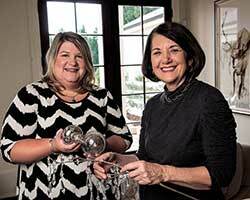 For the dining room table, McDaniel will incorporate the handmade fabric-and-twig turkeys into a festive centerpiece. McDaniel plans to use a rustic rectangular planter overflowing with fresh flowers and foliage in the rich colors of the harvest season in the tabletop vignette. As soon as the last Thanksgiving dessert is served, McDaniel said, she and her crew will begin decking the halls of the Maddox home for the Christmas season. The decorations will include several different Christmas trees, some real and some artificial. Upstairs, there will be a kids’ tree, Townsend said, that will feature the traditional reds and greens of Christmas with whimsical ornaments. The children will each have their own special Christmas trees in their rooms, including a half-tree that will be mounted flush to the wall and a tree for the mantle in Morgan’s sitting room. “Each child will have a remote to turn the lights on and off on their trees, and each one will be personal to them,” Townsend said. While artificial trees are practical for the children’s rooms, Maddox said having a live tree in the main living area is a must. Ultimately, Maddox said, that’s what all the decorating is about for her and her husband. And thanks to the efforts of McDaniel and her experts, Maddox said she and her husband won’t be too stressed out or too tired to enjoy the upcoming holiday season. “It’s a beautiful feeling to walk in and see it all done and know that we can concentrate on just enjoying it all,” Maddox said.